This shawl was knitted as a prayer shawl for a dear friend who has been going through some big challenges for quite a while now. I took the pattern idea from a baby blanket pattern in Vogue Knitting Baby Blankets (Vogue Knitting on the Go series) p. 50 "Ostrich Plume Lace Throw". My name there is knitsforpreemies. I will try to do better at posting here as well. I received handmade knitting needles for Christmas; they are made from dogwood. I was wanting to start a scarf for a cancer patient and am glad I waited to use the new needles. The yarn is slippery and a bit splitty, but these needles seem to be just what I need. They are soooo lightweight, and are just "sticky" enough to keep the yarn where it belongs without dragging. The needles were made by Amelia Chambers, who resides somewhere in northern Georgia (USA). I'm so glad my niece ran across them and remembered me. I tried to find these needles on Google searches, but no luck. I anyone knows how to get in touch with Amelia Chambers, I love to hear from you here at this blog. 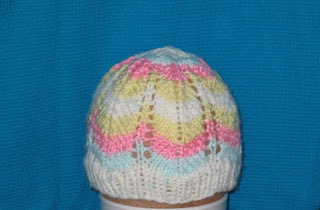 This little hat is a cable design, but you don't need a cable needle and there are no fiddly maneuvers to perform. The pattern is a free download on Ravelry, so check there for that. 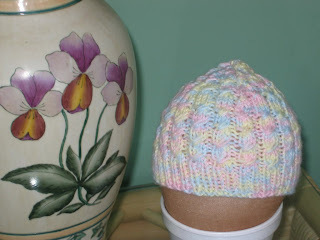 The pattern does not give baby or preemie info, so I decided to try reducing yarn and needle size to produce a preemie sized hat. 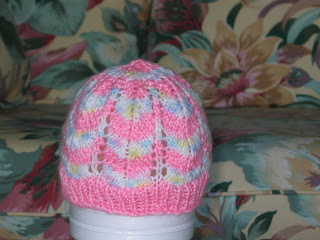 I cast on 72 and used Plymouth DreamBaby DK yarn with US # 4 for ribbing and US #5 for the hat. 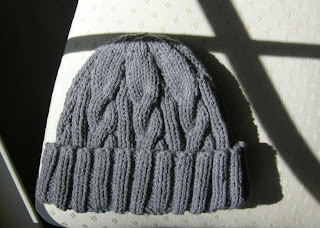 I did the ribbing with 12" Addi Turbos, but needed to go to double point needles to do the body of the hat. It's a fast and easy knit with great results. 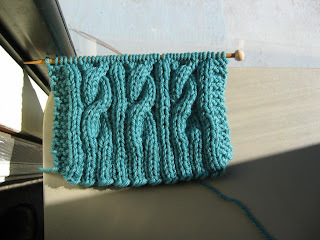 I only went with 4 pattern repeats before starting the reducing rows. Next time I'll try 5 repeats to give a little more height. Enjoy playing with the colors. 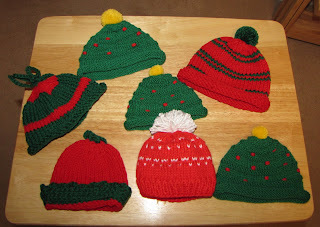 This is a wonderful way to use up yarn left-overs. Gray Irish Hiking Hat and Scarf are knit in Bernat Berella "4" yarn. 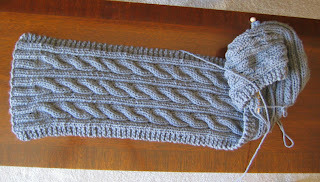 I used US #10.5 needles for the scarf. I used US # 9 circular for the hat. Stitch definition with this yarn is not quite as sharp as I would like, but that quality does lend the scarf and hat to a more masculine look. The green Irish Hikin g Scarf in knit in Mission Falls 1824 merino superwash wool. I used US #8 needles for the scarf.